Water damage happens to us when we least expect it. It can cause a lot of problems if we don’t address the issue right away. If it is a tiny hole that leaks inside your wall or a rusted pipe in your drywall bursts you may actually have to replace the entire affected area completely. It is very important to manage water damage and follow through with our water damage restoration process. Superior Cleaning and Restoration Inc. have been serving the people of Solana Beach for years. Not only can we assist you with the drying and fixing stage of the process but also help you with the re-construction and even in many cases, the re-modeling as well. Our staff is professionally trained and proficient in identifying water damage, the need for water restoration and all kinds of repairs that may be necessary as well. Our experts will restore your home back to the condition it was in before the flood. We will save you money as well. In some flood cases, we really don’t have much scope for prevention, since we cannot control nature, but we can offer you the best flood damage control. It is advisable that in areas that are prone to such outbreaks of natural disasters, you may take insurance coverage. We work in close coordination with top insurance companies, to help you recover the damage costs to get you back on your feet in no time. Superior Cleaning and Restoration Inc. is a preferred company by insurance companies like Allstate and Farmers. We can bill insurance companies and work with adjusters directly which speeds up the claims process. 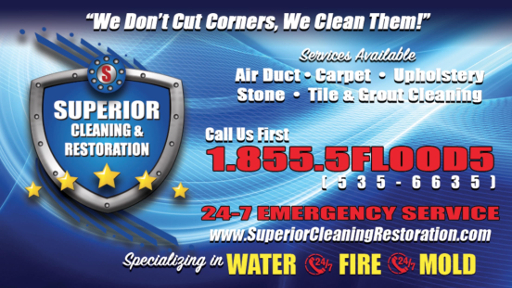 At Superior Cleaning and Restoration Inc. we realize the magnitude of your needs, we are fully prepared to tackle any condition that comes our way. We can fix issues ranging from sewer spillage to leakage in crawl spaces and everything in between. For the business community of Solana Beach, we have the commercial plans for water damage restoration. We are fully prepared and hold certification from the Institute of Inspection Cleaning and Restoration Certification for our services. For all of your water restoration and damage woes you can count on our experts to get the job done.